Shield Azure, a Marian crown Or, surrounded in orle by eight oleander blossoms Argent, the blossom in central chief is charged with a cross fleury Vert. 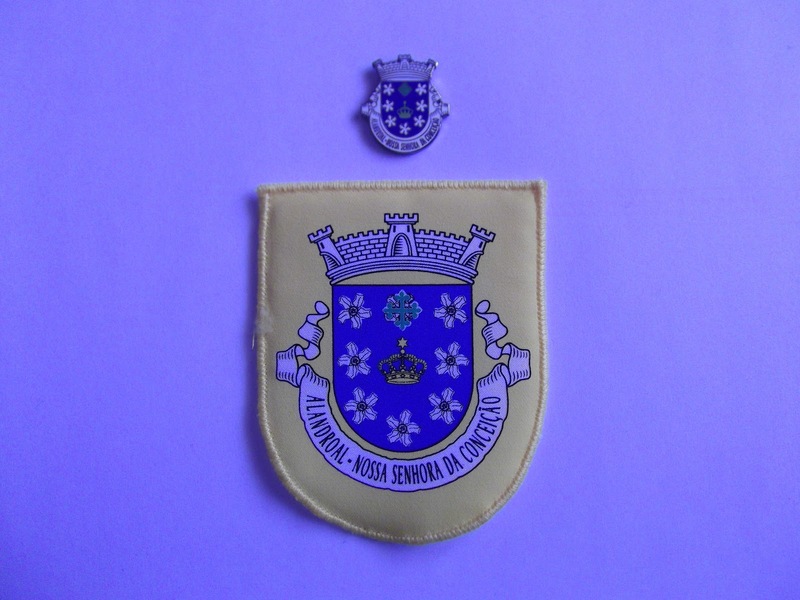 Mural crown Argent with three visible towers (village rank) and white scroll with inscription in black capitals "ALANDROAL - NOSSA SENHORA DA CONCEIÇÃO". The crown is referring to Our Lady of Conception, the local patron saint. The cross is referring to the Order of the Knights of Avis. Alandroal (Nossa Senhora da Conceiço) Commune was one of the pre-2013 communes of Alandroal Municipality; it had 1873 inhabitants in 2011 and covered 164.0 km². Shield Purpure, an arch Argent masoned Sable, in its open door a candle Argent lit Or, in either corner of chief a pit lamp Or lit Proper, in base hamer and mallet Argent hilted Or set in saltire. Mural crown Argent with three visible towers (village rank) and white scroll with inscription in black capitals "S. BRÁS DOS MATOS (MINA DO BUGALHO)". Meaning: The 2nd name of the commune means "miscellaneous mine". All the charges thus refer to mining. 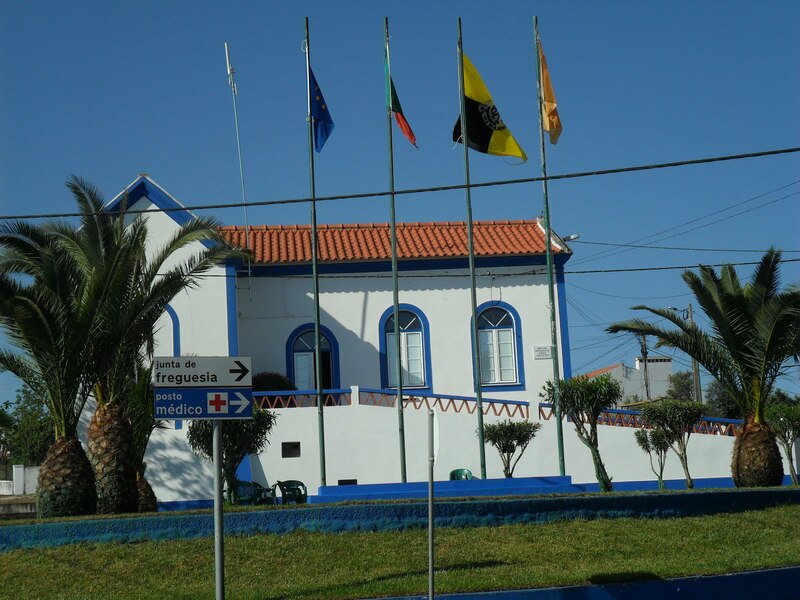 São Brás dos Matos (Mina do Bugalho) Commune was one of the pre-2013 communes of Alandroal Municipality; it had 364 inhabitants in 2011 and covered 63.5 km². Shield Or with base wavy of Azure and Argent, issuant from base an embattled tower Gules masoned Argent with port and windows Argent, hanging down from embattlements a broken chain Sable at either side. Mural crown Argent with four visible towers (town rank) and white scroll with inscription in black capitals "JUROMENHA - NOSSA SENHORA DO LORETO". The tower, usually an attribute of Sta. Barbara, here probably just refers to Juromenha fortress. 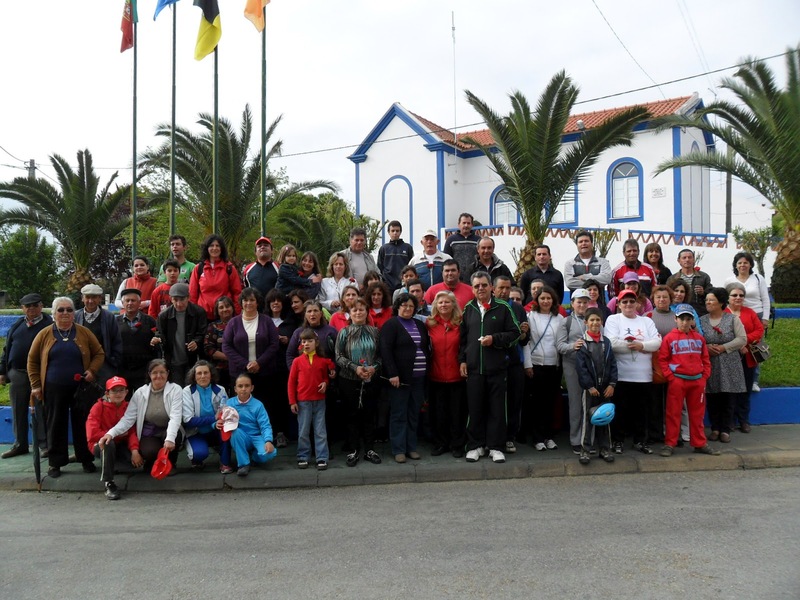 Nossa Senhora do Loreto (Juromenha) Commune was one of the pre-2013 communes of Alandroal Municipality; it had 107 inhabitants in 2011 and covered 32.1 km².